If you live in a place where you can’t play during the winter, like I do, spend your time these next few months working on these things that will make a world of difference in your shot-making. Grip: Whatever your grip is like, practice to make it be the same every time you pick up a club. Little changes in how you place your hands on the club make a big difference in how the clubhead meets the ball. Ball position: For balls hit off the round, and hit off a tee, find the position that lets you hit your best shots. That position might be farther back in your stance than you think it should be. Rhythm: The ratio of the backswing to the downswing is 3:1. Practice to make this your habit. This is the same as learning to be patient when you swing. What gets rhythm out of whack is rushing. Impact: Your hands must get back to the ball before the clubhead does. See my video lesson for a drill that shows you what that means and shows you how to teach yourself to do it. Putting: Yes, putting is shot-making. Practice at home to find a stroke that brings the clubhead into the ball square to the starting line and makes contact off the sweet spot of the putter’s face — every time. It will take daily practice and a lot of experimentation to figure this out. By the time you finish, you will likely have a very different stroke than you had before. You can practice all of these things at home, except the second one, which you should be able to figure out after one trip to the driving range. Then practice at home by taking an address with the ball in that exact spot. This week I’m going to take a break from talking to you about golf. I’m going to talk instead about something that could save your life. Rule: If one day something is wrong with you and it doesn’t clear up by itself in two weeks, go to a doctor to begin a process of diagnosis. Two years ago, in November 2014, I followed that rule, as I have done for many years. While diagnosing my complaint, an imaging study revealed a tumor. By the sheerest bit of luck, not only in timing, but also in the location of the tumor, I was diagnosed with cancer at a very early stage. So far the treatments have been successful and my prognosis is good. The doctors said the original complaint was nothing to worry about and it cleared itself up in six weeks. Had I waited it out, I would not have known about the cancer until it had become quite advanced. I have talked to several cancer patients whose disease was also found by the merest accident. There are many reasons why people don’t go to see a doctor. They are afraid of what might be found. They know what it might be and are afraid of the treatment. They don’t have time to be sick right now. I don’t go to doctors and I’m OK so far. And so on. I can’t argue with these reasons because they are sincerely felt. All I can say is, go see the doctor anyway. I’m not trying to be alarmist. The next time you feel something is off, it’s probably not anything big. But then it might be. You never know. So you have two weeks. Then you go see the doctor. O.K.? The driving range is about hitting shots. The golf course is about scoring. Here’s how to make the first one easier to bring to the second one. 1. Pick a target for every shot. Not a direction, but a spot on the ground where you want the ball to land. 2. Go through your entire pre-shot routine before you hit the ball. Don’t swing at the ball until you have the feeling that this will be a very good shot. 3. For the next shot, pick a different target. 4. Change clubs after every three shots. 5. Take a break every now and then. Get out of your groove before you resume. 6. Hit some fades and draws. Hit some high shots, some low shots. 7. Develop a shot for when you just can’t go right. Same for when you can’t go left. Same for This one has to go straight, distance be hanged. 8. Make it fun. Make hitting golf balls something you enjoy, not something you work at. Two weeks ago I talked about the importance of having light grip pressure. I wanted to put up graphs comparing the grip pressure of a professional golfer with that of a mid-handicapper, but I couldn’t find them in time for publication. Well, while prowling around the house a few days ago, looking for something else, I found the book that has the graphs. 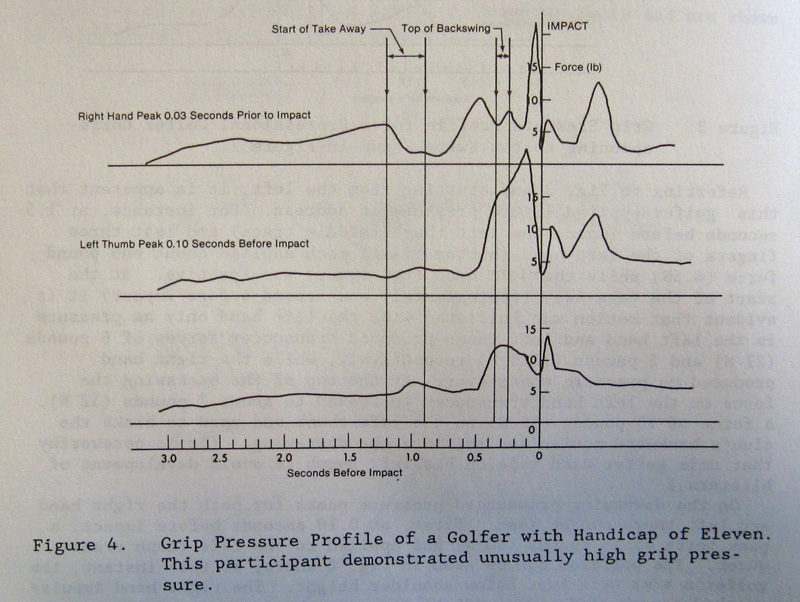 The graphs are taken from a paper titled, Evaluation of Golf Club Control by Grip Pressure Measurement, by D.R. Budney and D.G. Bellow, reprinted in Science and Golf, A.J. Cochran, Ed., 1990. Golfers swung a club with three transducers built into the grip to measure left hand pressure, right hand pressure, and pressure under the left thumb. The first graph shows the grip pressure throughout the swing of a professional golfer. Notice that in the early stages of the swing, pressure at all places is quite light. Pressure rose during the backswing in the left hand and thumb, and peaked in the right hand and left thumb during the downswing. Notice the drop in pressure in those two spots at impact. Left hand pressure reached its peak just after impact. The next graph is of an 11-handicap golfer. Pressure is greater from the very start. The patterns of peaks and drops occur at roughly the same places as for the professional golfer, but there is much more pressure at every point. The amateur golfer is holding the club much tighter. These graphs show that no matter what the grip pressure is at the start, it will tighten during the swing as the club moves faster and faster. Keeping the pressure light at the start will minimize peak pressure, keeping as much tension as possible out of the hands and arms, leading to a more fluid and controlled golf swing.